Are your aftermarket LEDs causing problems? Noise? Flickering? Loss of radio reception? Interference with ELOG and FM? Cyron ABFT100 active digital filters greatly improve, and in most cases completely eliminate such adverse effects. Simple plug and play installation. Can be hardwired by removing the male/female plugs. Sold in units of one for each light. IMPORTANT: Please carefully follow all directions in the user manual to maximize the effectiveness of the filter. The performance of ABFT100 filter depends on the amount of the EMI interference created by your light. Although it works in most cases, it might not be a 100% solution for all lights. 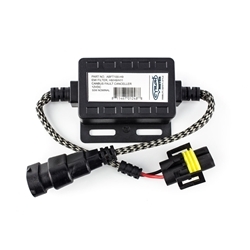 For a noise-free light you may also consider Cyron Elite series headlight LED bulbs. Great choice for Cars, Trucks, Boats, RVs, etc. 2.75" x 1.5" x 1"